Anyone who's helped a friend move has most likely learned a few things. The first is that they may not volunteer again soon, and the other is that books are heavy. 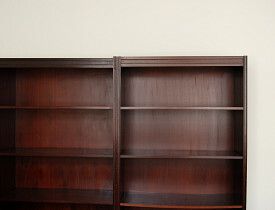 By nature, bookcases are built sturdy to handle hundreds of pounds of books. Most bookcases rest peacefully on the floor so the load is fully supported. But there are few styles of bookcases that never see the sturdiness of a floor. These wall mounted versions have special requirements. This may not be obvious to people who don't build custom furniture and cabinetry as part of their livelihood. The vast majority of commercially available bookcases are designed for floor use. The primary difference lies in the construction of the back panel and how it is configured with the bookcase’s sides. Wall-mounted cabinets (and some bookcases fall into this category) have backs with mounting strip “panels” or full thickness back panels. In most floor-resting bookcases, the back panel is a thin 1/8” to 3/16” thick decorative panel that is merely tacked on with some very small wire brads or small nails. The mechanical bond between this cosmetic panel and the rest of the case is designed to carry only the weight of the back panel itself. For a bookcase to be wall mounted, a minimum 3” to 4“ wide strip of material needs to be fully integrated with the case’s side panels, where the loads can be accommodated. As an experienced professional carpenter, when I build wall cabinets, I like to use full-sized back panels that have multiple mechanical fasteners to the cabinet’s side panels. This distributes the load over a wide area, and therefore limits the loading on any individual fastener. Most commercial wall cabinets will have a pair of strip panels to take these loads rather than full-sized back panels. In the case of most wall cabinets, heavy-duty screws or bolts are used. One common size for mounting kitchen cabinets is a #10 by 3” screw. These are driven through the cabinet’s mounting panels and into the walls framing. A basic kitchen cabinet may use 4 of these screws to keep the dishes from crashing onto the floor. A screw like this set only in drywall is a recipe for disaster. If studs or framing are not found or available, butterfly toggles can be used. This type of anchor spreads the load over a much wider area of the drywall than the simple threads of a screw. Mounting cabinets or bookcases in concrete or on wood paneled walls may require more “specialty” types of anchors. Another common mounting method for large heavy objects like cabinets and bookcases is the “French Cleat.” Here, a matched pair of beveled boards is used. One is firmly mounted to the wall, and the other is firmly mounted to the cabinet. The beauty of this mounting method is that no tools are needed once the cleats are installed. The cabinet can be removed by simply lifting it off of the wall cleat. Very large cabinets may use pairs or sets of these cleats for mounting. Another advantage of this system is that you do not need to support the cabinet during the mounting process as with standard screw or toggle installations. The cleat is firmly mounted to the wall, via screws, toggles, bolts, etc. and then the cabinet is lifted and “hung” on the cleat. Since I do a lot of these installs solo, this is a very handy method of installation. For a French Cleat to be concealed, a bookcase or cabinet will need a recessed back panel. This allows the side panels of the cabinet to contact the wall when installed. This not only looks best but provides for more lateral stability. Kevin Stevens writes for networx.com.